Delores Christine (Knacke) Dietel, 89, of Lester Prairie, died Tuesday, March 28, 2017, at St. Mary’s Care Center in Winsted. Casket bearers were Greg Dietel, Rachel (Dietel) Hoskins, Steven Dietel, Michael Dietel, Erin Herrmann, Andrew Dietel, Eric Dietel and Katelin Dietel. Interment was in the Fort Snelling National Cemetery in Minneapolis. Delores Christine (Knacke) Dietel was born July 12, 1927, in Bergen Township, McLeod County, the daughter of Edward and Lydia (Bathen) Knacke. She was baptized as an infant July 27, 1927, by the Rev. Arthur Spleiss, and was confirmed in her faith as a youth April 6, 1941, by the Rev. E. Stahlke, both at St. Paul Evangelical Lutheran Church in Lester Prairie. Her confirmation verse was Hebrews 10:23. She received her education in Lester Prairie, graduating from Lester Prairie Public School. On Aug. 16, 1947, she was united in marriage to Raymond “Ray” Dietel by the Rev. R.A. Ritz at St. Paul Evangelical Lutheran Church in Lester Prairie. The couple made their home in Lester Prairie. Their marriage was blessed with three sons, Brad, Dale and Dan. They shared over 67 years of marriage before Mr. Dietel died on March 19, 2015. In addition to being a loving wife, mother and homemaker, Mrs. Dietel worked at Green Giant in Glencoe, Young America Corporation in Young America, and Telex in Glencoe. She was an active member of St. Paul Evangelical Lutheran Church in Lester Prairie, where she served on the LWML and was a Sunday school teacher. 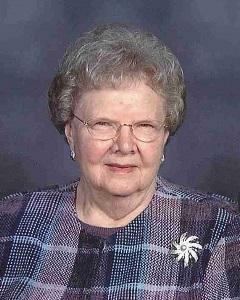 She also was a member of the Lester Prairie American Legion Auxiliary Unit 463 and served as a past treasurer. Mrs. Dietel enjoyed gardening, crocheting afghan blankets, baking and desserts, especially cinnamon rolls and butterscotch desserts. She loved to reminisce about the gold toilet they used for cards at their 50th wedding anniversary, and when her entire family celebrated their 60th wedding anniversary at Rush Lake. She cherished the time spent with her friends and family, especially her grandchildren and great-grandchildren. She is survived by her sons and their wives, Bradley and Kathy Dietel of Sparks, Nevada, Dale and Jane Dietel of Lester Prairie and Daniel and Patrice Dietel of Lester Prairie; grandchildren, Greg (Beth) Dietel of Jordan, Rachel (Dietel) Hoskins of Houston, Minnesota, Robert (Greta) Mierau of Caledonia, Tamara Lucido of Glendale, Arizona, Steven (Melissa) Dietel of Lester Prairie, Michael (Jessica) Dietel of Victoria, Erin (Matt) Herrmann of Lester Prairie, Andrew Dietel of Mound, Eric (Hannah) Dietel of New Richmond, Wisconsin, and Katelin Dietel of Lester Prairie; great-grandchildren, Amanda (Nate) Giannettino, Leah (Erik) Aamlid, Jenna Dietel, Thomas Dietel, Tyler Hoskins (fiancée Keela), Brett Hoskins, Brennan Mierau, Karsen Mierau, Heather Mierau, Sawyer Mierau, Kaelyn Lucido, Logan Lucido, Rylee Lucido, Alec Dietel, Maxwell Dietel, Carson Dietel, Caiden Herrmann, Bennett Herrmann and Teagan Herrmann; sister-in-law, Leona Schultz of Winsted; brother-in-law, Stanley Rustad of Waconia; aunt, Lorraine Kerian of Golden Valley; nieces, nephews, other relatives and many friends. She was preceded in death by her parents, Edward and Lydia Knacke; husband, Raymond Dietel; brother, DeVan Knacke; sister, Angeline Stender; brothers-in-law and sisters-in-law, Henry Dietel, Irene Klaustermeier, Clarence Dietel, Linda Hoernemann, Elmer Dietel and Adela Rustad. Arrangements were with the Paul-McBride Funeral Chapel of Lester Prairie. Online obituaries and guest book are available at www.mcbridechapel.com.